Noclip World — Alephograph: Architecture, drawing and video games. 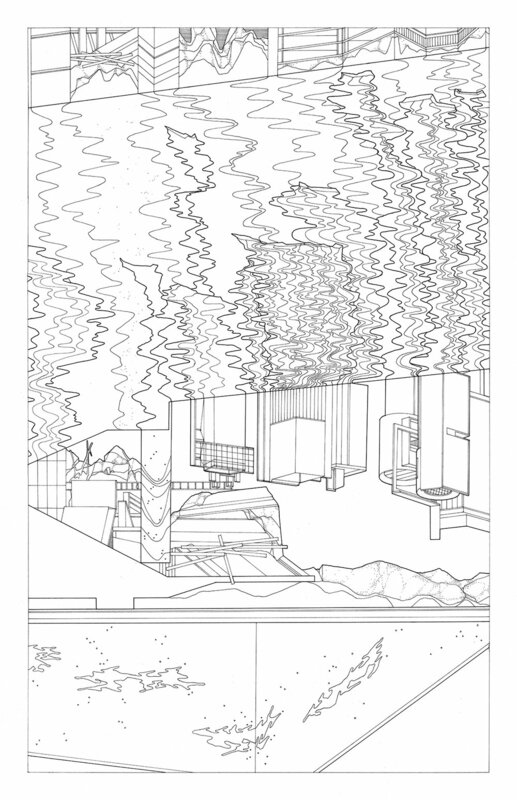 Noclip World is a research project that uses handmade architectural drawings as a tool to peel apart the contingency of virtual video game worlds. With reference to the work of artists such as Harun Farocki and JODI, I use the 'noclip' cheat code to break and ghost through virtual environments, recording the phenomena witnessed by the virtual camera as a result. 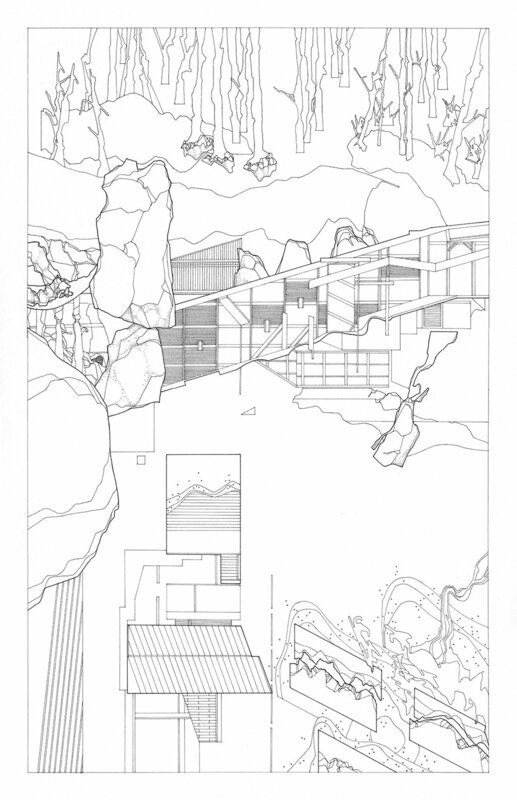 These phenomena were then transcribed into a series of 26 pen and ink drawings that reframe these broken video game spaces as architectural constructs in their own right. Work from this project has been published in journals such as Drawing: Research, Theory, Practice and CLOG: Sci-Fi. Hall of Mirrors. A phenomena observed in game worlds broken by cheat codes since the days of Doom. 11 x 17 inch, pen on paper. Dissolving Surfaces. The virtual camera become steadily over exposed once placed at the threshold of an interior and exterior space. 11 x 17 inch, pen on paper. The Clip House. Architectural structures that emerge through the Hall of Mirrors phenomena. 11 x 17 inch, pen on paper. Clipping Frames. The perspectival virtual camera meets spaces designed to be seen from afar, causing a rupture in their spatial composition. 11 x 17 inch, pen on paper. Vertical Ruins. Seen from the proscenium of the level, the bowels of the architectural setting becomes revealed as a landscape of cave-like spaces. 11 x 17 inch, pen on paper. Exposed Weather. Internal spaces and exterior landscapes complete with their weather systems and atmosphere are revealed as the player breaks through the edge of the environment. 11 x 17 inch, pen on paper. Facsimile Structures. At the edge of the game space, the architectural setting dissolves into mapped images that break down in scale once the player navigates to the fringes of the world. 11 x 17 inch, pen on paper. Underwater Distortions. Cutting through the edge of a body of water, we see that it is nothing but a single plane of geometry. 11 x 17 inch, pen on paper. Fragmented Facades. As we traverse through the game space, architectures fragmented, windows become windows within windows and the environment seeps through into interior spaces. 11 x 17 inch, pen on paper. Inside a Cliff Face. Cutting through a cliff reveals all the layers which congregate together to create the game space. 11 x 17 inch, pen on paper. Skybox. Revealing the 'cube-mapped' sky that hangs over the level, implying environmental extents which do not exist. 11 x 17 inch, pen on paper. Further into the Noclip World. 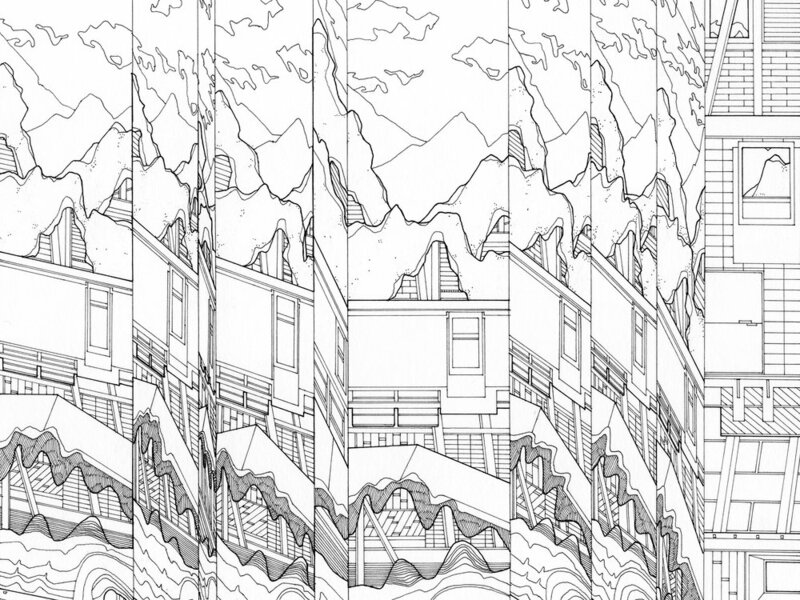 The architectural morphology of a glitched video game world. Digital drawing made on Wacom Cintiq.